The first three statements that SLO Little Theatre director Bill McLaughlin makes about playwright Del Shores are that he’s got a cult following, he’s gay, and he grew up in Texas. And while the only circumstance more grueling than growing up gay in the Lone Star State is growing up gay in Utah, Shores explores his roots to great comedic advantage. 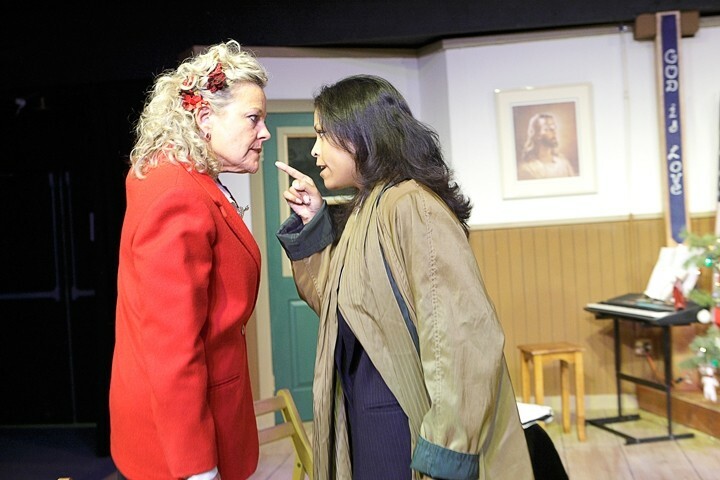 CUTLINE : Susie Fulton and Jo Mani sling accusations of racism and ungratefulness as Darlene Parsons and Sharon Johnson in SLO Little Theatre’s production of Daughters of the Lone Star State. McLaughlin is so appreciative of Shores’ satirical abilities that as a member of the Little Theatre’s season selection committee, pushed for a production of Shores’ Daughters of the Lone Star State. The comedy exposes the racism and classism of an elitist women’s group, founded under the banner head of “the privileged helping the underprivileged,” an edict the racist old biddies don’t adhere to so much as trample. Originally, cynics questioned the relevancy of the play, a concern McLaughlin dismissed, citing a parallel between the play’s themes—racism and the slow death of the old guard—with the sound political spanking (not the term McLaughlin used, but appropriate nonetheless) the Republican Party received during the recent national election. The ensemble is entirely comprised of women, which McLaughlin insists wasn’t particularly difficult to cast despite a low turnout during auditions. The biggest challenge was finding two black actresses in a community that resembles a Petri dish for Aryan breeding. McLaughlin resolved this issue by approaching two women at Pepe Delgado’s, introducing himself as a director at the SLO Little Theatre, and asking if they had any interest in performing in the production. This somewhat unorthodox approach to casting nonetheless achieved the desired result. The actor and director has been working with the Little Theatre since 1991, when he relocated from Los Angeles. His past directing credits at the theater include the Ray Charles and Elvis Presley Legends shows, Crazy For You, Petrified Forest, To Kill a Mockingbird, Crimes of the Heart and The Cripple of Inishmaan. The majority of community theater performers tend to be women, according to McLaughlin, and many of these volunteers have just finished raising a family, placing them within a very specific age bracket—the 50s, 60s, and 70s demographic that the majority of the daughters fall within. The setting for the meeting-turned-coup is the community hall of a church, the sort of space that calls to mind potlucks and bingo games presided over by matriarchs with generously circumsmeared lipstick, indistinct in a perfume fog. While creating this utilitarian space was simple, McLaughlin insists that making it theatrical was anything but. Jesus stares benevolently out from a canvas hung from one of the mud brown walls, mildly interested in the proceedings. But the Texas flag receives top billing, sprawling above the stage and its embattled occupants. In order to lend some much-needed seasonal cheer to the raucous old biddy proceedings, McLaughlin went on a Christmas tree hunt in early November. “I went out to the Nipomo Christmas tree farm and I knocked on the door, because they’re not open yet, and I said ‘I want the ugliest tree that you have,’” he narrated, with a laugh. “And he looked at me like I was crazy.” McLaughlin’s Charlie Brown tree becomes the source of one of several humorous interruptions that punctuate an atmosphere fraught with racial and class tension. And the drawling Southern ladies driving the locomotive bound for crazy-town are characters, perhaps too closely resembling a Californian stereotype of old guard, racist Southerners, but entertaining nonetheless. Darlene Parsons (Susie Fulton) is a recovering alcoholic who takes a very hard fall off the wagon following the death of her Chihuahua, Paquito. Parsons spends the majority of the meeting swinging, both verbally and physically, at anyone who crosses her path. Mildred Keifner (Rosh Wright) lives in a realm of delusion where she is both a singing sensation and Darlene’s best friend, neither being true. Clara Bell Ivey (Sue Skanes) can do little but gasp in horror at the sudden unwelcome minority presence while Lois Wheelis (Dottie Thompson) is something of a renegade, inasmuch as anyone named Lois could be. And Vergie Hopkin (Jill Turnbow) watches the unfolding spectacle with what can only be described as glee, contributing unhelpful observations until she, too, is absorbed into the fray. While the play bills itself as a comedy, there is no disregarding the explicit racism that issues from the mouths of many of the daughters. These aren’t Robert Harling’s steel magnolias, and even at their best—emitting occasional sparks of humanity—you can’t quite ward off a sense of relief at their impending extinction. The SLO Little Theatre’s production of Daughters of the Lone Star State runs through Dec. 14 with shows at 8 p.m. on Fridays and Saturdays and 2 p.m. Saturdays and Sundays. Tickets cost $22 for general admission and $19 for students and seniors. For more information visit www.slolittletheatre.org. Arts Editor Ashley Schwellenbach wonders when homophobia will be taken as seriously as racism. Send rainbow flags to aschwellenbach@newtimesslo.com.